Now. almost three months later, “Begin Japanology” host Peter Barakan explores Enka and visits this very Enka store in Ueno! As he interviews the shop owner, look to the background and you can briefly see the photograph of Andrew and me, Andrew under his cowboy hat and me to his right, although we were mostly cropped out of the video. So, now we have come full circle: from watching NHK programs that inspire us to explore Japan, to photographing Japan and being photographed in Japan, to finally having photographs of us appear in an NHK program. 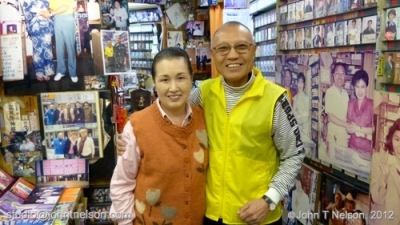 And wow, I’m flattered that the owner of this Enka store posted the photo of us on his wall so prominently!